The elderly man shifted in the wheelchair, and Nash Marino reached down to tuck in the loose blanket around his patient. He glanced up as the elevator stopped, then blinked and stiffened a bit when he saw a familiar figure from his recent past step into the elevator. Not that he had anything against Truman Greene—he’d always enjoyed the company of this man and his entire family. In fact, he missed them. A lot. It wasn’t Truman’s fault things had gone so wrong between Nash and the man’s son. Hell, it wasn’t anybody’s fault. That was one of the things that pissed Nash off the most about the whole situation. He couldn’t reasonably be angry at anyone involved, not without looking like a jackass. He was definitely more than a little peeved at fate, however. To Love and To Cherish is a novel length story spinning off from ’Til Death Do Us Part. 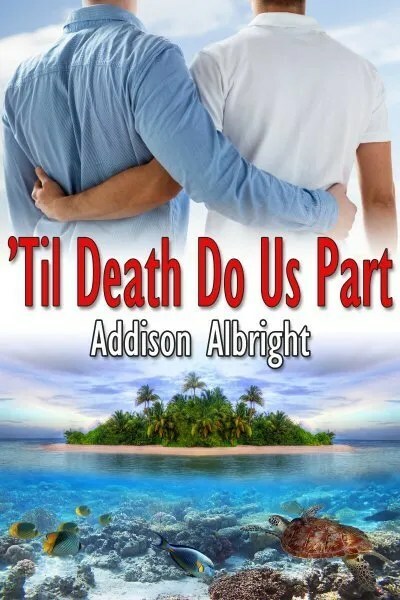 ’Til Death Do Us Part has received a 2016 Rainbow Award Honorable Mention. Got to admit, I’m still a little peeved with Nash. Not that he knew or anything, fate was totally the bad guy there, but… Well, he did make me want to claw out his eyes. Congrats on your special mention! Well done! I love your “more than a little peeved at fate”. He seems to be the master of understatement. If the sight of the father riles him up, what will seeing the man himself do to poor Nash? Looking forward to more of his story. Ha! I love “peeved at fate.” Looking forward to seeing Nash’s path to his own HEA, though. I suspect it’s not going to be so straightforward. 🙂 There’s nothing even remotely straightforward about Nash’s journey. It’s a wild one. Ooh, definitely makes me wonder what happened between them! Ah, well that part’s not a secret, because the blurb of the book this spins off from answers that. In a nutshell, Nash’s fiancé’s husband wasn’t as dead as everyone thought he was. Can’t wait to see his reaction when he sees the Truman’s son again. I hate it when I want/need to be angry but there’s no one to be angry at. Great snippet. Can’t be upset, but still is, it seems. There’s a lot of underlying stuff going on here. Good snippet. So many emotions I’m going through. Great snippet. Wow, one really emphasizes with Nash here, his conflicting emotions, poor guy! Thanks for the share. Looking forward to reading more. I love the characterization you accomplish with just the first paragraph, and the rest really piques the reader’s interest in the backstory. Great opening and great snippet! LOL. Loved the “peeved at fate” line! Certainly sums up a lot. It’s frustrating to want to be mad but not have anyone to be mad at. Blaming fate seems like a good alternative in that case.